Commemorating the first member of the Uberthons Hall of Fame, Eileen Kuffner, just before the race! As an Uberthons Ambassador, I look forward to starting the new year off with the annual Winter Event at The Reserve Vineyards and Golf Course. Over the years, Uberthons and The Reserve have developed a symbiotic relationship; as the weather turns less favorable for golf beginning in late fall, it opens up the golf course for running races. Thus, the Halloweenathon in late October and the Winter Event in mid-January have been regular events for several years now. This year’s Winter Event took place on January 19. The weather at past Winter Events has ranged from frigid to wet to relatively balmy, and this day was right about in the middle: cool and dry. Packet pickup had been a day earlier, and everyone walked out with something to wear. The half marathoners got the event shirt, while quarter marathoners and 5K runners got to pick an item of apparel from past events. Having plenty of race shirts, I opted for a pair of Uberthons shorts. As usual with Uberthons events, the course was well-marked, and on this particular day, race directors Darwin Rasmussen and Randy Wilder led the way for the 5K runners in a golf cart. We followed the cart, but then about half a mile into the race, the cart stopped, and Randy waved us on. I’m not sure but I think the cart couldn’t get around someone on the course. Soon after, the cart started up again, and from that point on, the cart was chasing me! I’ve run lots of Uberthons races at The Reserve on the north and south courses (and both in the same event), and yet this one had a little surprise for me. 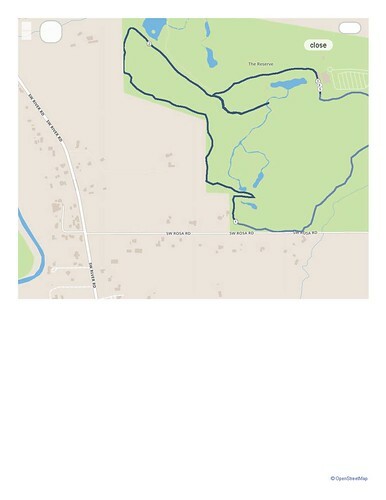 It may be that the main course was configured for a quarter marathon (with a second loop for the half marathon), and the 5K was massaged to fit within that main course, and that massaging required some changes to the usual 5K course. In any event, the surprise was at 2 1/4 miles into the race. Being a bit de-trained from not enough weekly mileage, I was staggering along at something slower than the pace I ran a half-marathon a few years ago. There was a fork with race volunteers directing us to the right. To the right, I saw runners who had been ahead of me the whole race. Some of them were coming toward me…. Oh no, I thought to myself. An unexpected out-and-back! It was only 0.4 miles round-trip, but boy did it feel longer in the moment. With the out-and-back out of the way, it was a mostly straight final 1/2 mile to the end of the 5K. I sure was glad that I had signed up for the 5K, not the quarter marathon even though the 10K is my favorite race distance. There’s a lesson here: whatever your usual weekly running volume is, if you’re too far below that, you may find it hard to achieve the results you want. One of the features of Uberthons events is the post-race food spread. Sometimes you get burgers, other times Qdoba, and at the Winter Event, it was a soup bar. Perfect for a cold morning! I got a bowl of clam chowder, added bacon bits, and skipped the cheese. The food spread also included bread and fruit, but after a race, there’s only so much I can eat. 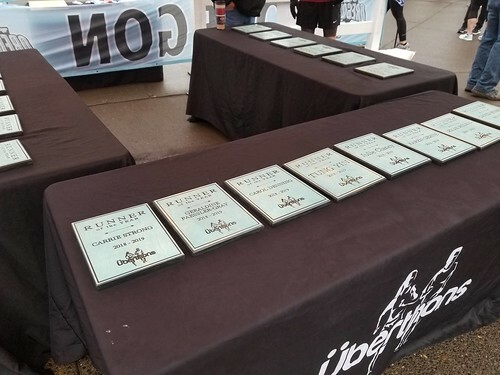 Besides the food, there were the race awards, 1st/2d/3d for overall winners, Masters’ (45+), and Seniors’ (65+), as well as age group winner pins. 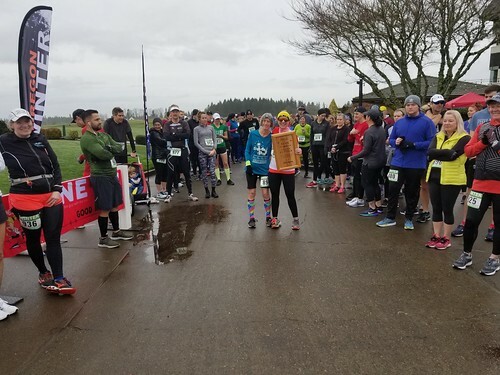 And Uberthons announced the first member of its Hall of Fame, Eileen Kuffner; and named 20 Runners of the Year, who each received a personalized plaque. All in all, this was another great event with everything that I’ve come to expect from Uberthons. With attendance of several hundred, there’s a lively and festive atmosphere, but it’s not overcrowded.